I’m thirty-four and single. Two years ago I decided to get serious with what I want out of life. But first, I have to get a wife and I know just the woman I want to settle down with. I’ve had my eyes on Melanie Summers for quite some time now and, since my brothers want to hire her as the new marketing manager at The Champion Corporation, I think it’s time I made my move. Hey, the straightforward approach worked for Dante. Why can’t it work for me? I’m so not ready for a relationship. But seeing my best friend Emily happily married makes me want to believe in true love again. But I’ve had my heart broken so many times, I’ve lost count. Plus, I carry a secret with me that is sure to send a man like Dimitrius Champion running for the hills, the same way it sent my ex, Scott, into the arms of another woman. Book 1, His Paradise Wife is Dante Champion's story. Book 2, When A Champion Wants You is Dimitrius Champion's story. Book 3, The Best Thing He Never Knew He Needed is Desmond Champion's story. 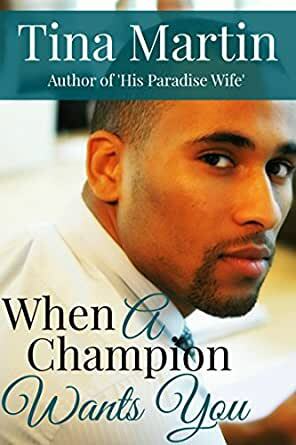 Book 4, Wives And Champions is a family novel. Book 5, The Way Champions Love, is Harding Champion's story. This was nutty and sweet all mixed together. This time around we have "won't take no for an answer" brother. After doing a complete 360 on our h, the H jumps in feet first and full speed ahead on the love train. Taken completely by surprise, the h is totally against this speedy relationship, especially since she's holding on to a huge secret. Again, very enjoyable but light on the steamy parts. I loved the ending, it was just perfect. 5.0 out of 5 starsLove this story! I love how Dimitrius and Melanie healed each other’s hurts from past relationships by loving each other. It almost didn’t happen because of both of their stubbornness but I’m glad they had people supporting them with positivity. Side note: Scott is a jerk for what he did to Melanie in that restaurant. It wasn’t enough that he left her but he had to still disregard her feelings. There is nothing like an Alpha male who states emphatically who, what, when and where, Dimitrius Champion does just that. A very touching story. Ms. Martin finessed it in away you could understand, feel sorry for, and be angry with the characters all at once. Tina martin does it again fantastic book the champion brothers was great if you have faith anything can happen. The brothers was very close great to have that kind of love for one another. They saw the women they chose to spend the rest of their lives with an when after her what a man. Gave it 5+ can't wait for Desmond story. Champion brothers when their mind is made up, they love hard and unconditionally. True love is priceless, and righteous. You are truly blessed if a person loves you that way. Unfortunately all of us are not blessed in the love department, But be of good courage we are blessed in so many other areas in our lives.